Rheinmuenster, Germany – Colibrex, the pioneer and worldwide market leader in drone based radio frequency measurements, today announced that it has recently completed countrywide antenna measurements for the Malaysian DVB-T2 broadcast operator MYTV Broadcasting Sdn Bhd. It is the first time that these drone measurements are performed in Asia. The new Malaysian DVB-T2 broadcast operator MYTV is in the midst of implementing and rolling out their nationwide Digital TV network. As part of the network deployment, MYTV has to install new DVB-T2 transmitter systems all over the country. As most of the new antennas have to be mounted on existing towers, it is even more crucial to verify the transmission characteristics of these new installations. Colibrex and its long-standing Malaysian partner Wamata Solutions Sdn Bhd started work several months ahead of the actual measurements to obtain the necessary flight approvals and to schedule the flights. The work included organizing the logistics, coordinating the measurement flights with various authorities and obtaining appropriate approvals, e.g. from the Malaysian Department of Civil Aviation (DCA). 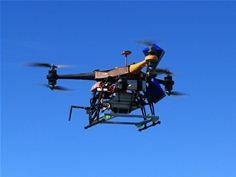 The drone measurements enabled MYTV to detect installation errors, incorrect antenna configurations and factory faults on the newly installed antennas. MYTV was able to take immediate corrective measures together with the system supplier. “We are excited to be the first broadcaster in Asia to use Colibrex’s drone based measurement, and the results have been encouraging. Knowing how the antennas perform in their real environment and having the opportunity to immediately engage corrective measures with the system supplier or with the owner of the masts are of great benefit to MYTV. The Colibrex solution led to savings in both costs and time. We are already preparing the measurement of additional sites as we believe we will realize the same positive impact on our budget and time schedules as with the preceding measurements,” said Michael Chan, CEO of MYTV. Colibrex has already realized over eight hundred successful measurements in similar projects across Europe, Africa, North and South America. Colibrex is a 100% subsidiary of LS telcom AG, a global leader in spectrum efficiency. LS telcom’s products and services assure that all spectrum users achieve their radio communication objectives in the most optimal and cost-efficient way. Colibrex is the pioneer and worldwide leader in drone RF measurement. We develop and provide specialized services and innovations for radio frequency measurement and the operation and regulation of drones. Colibrex has recently introduced “Drone-Flight-Check”, a drone registration and authorization management database and app. The solution addresses the growing concerns and impacts of drones on aeronautical and public safety and homeland security. It combines Colibrex’s experience as a professional drone operator with the long-standing expertise of its parent company LS telcom, in the design, adaptation, and maintenance of dynamic databases. LS telcom’s databases are in use at regulatory authorities around the world.